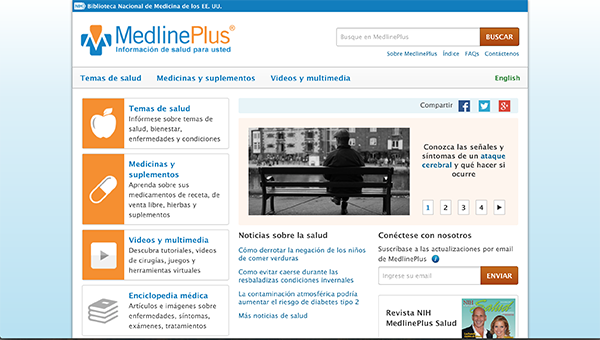 MedlinePlus is a consumer health website produced by the U.S. National Library of Medicine (NLM), available in both English and Spanish. As part of our Search Engine Optimization (SEO) strategy, we recently added meta descriptions to our health topic pages. A meta description is a short HTML attribute in the head tag that describes the contents of a web page. When the meta description is not available or is poorly written, search engines automatically generate their own version to describe what is on a web page. They may use snippets from the page, text from anchor links, or other sources on the page. These sources lead to varying degrees of quality for automatically generated web page descriptions. By leveraging the meta description, content owners provide search engines with their preferred descriptions. While custom meta descriptions don’t factor in boosting a page’s rank in search results, they help users know what to expect from a webpage. People are more likely to click through to the site when the meta description is well-written, increasing clicks and conversions. Social networking sites like Google+ also use meta descriptions when users share your page. The display is more elegant than what is generated automatically by the site. Similarly, Facebook uses Open Graph markup to pull information such as the page description when a user shares a page. Given that approximately 80% of traffic to MedlinePlus comes from external search engines and Facebook is our top social referrer, we decided that optimizing our pages with the meta descriptions would improve the external search and social sharing experience for our users. Nine NLM staff wrote descriptions for 978 English health topics over eleven weeks. Staff members spent 30-60 minutes per week writing the meta descriptions, which were added to the site in four batches throughout the project time span. Use no more than 150 characters in the meta description. While there is no concrete rule about character limits for meta descriptions (most resources say 150-160 characters), the MedlinePlus team decided to go with 150 so that there would be a low likelihood of the descriptions being cut off in search results. Use relevant keywords, when possible from Google Key Word Planner and Google Trends. Keywords tell us what people are searching for. Incorporating those words into the meta description when appropriate helps users know that the page will be highly relevant to their information need. Use action words such as learn, read, find, etc. Action words give the user a reason to click through to the page. Don’t use special symbols such as ampersands (&) to ensure a consistent and clean display in external search engines. Create unique meta descriptions for each page. MedlinePlus continues to evaluate the impact of the custom meta descriptions to our pages for Google click-through rates. Bing and DuckDuckGo use meta descriptions consistently, so custom meta descriptions enhance the MedlinePlus external search engine presence. Meta descriptions and Open Graph description tags provide the opportunity for us to highlight contents of a page and let users of social media know precisely what information is available. We will also be leveraging the meta descriptions in our internal search engines to improve user experience.